This was one of the best of the IHS symposiums, with such compact and convenient facilities, a perfect climate at the best time of year, and well-coordinated, excellent events. I have been to many symposiums, especially at the beginning when I was involved with starting the society. I haven’t been to one for a while. It was delightful to meet friends I hadn’t seen in donkey’s years. 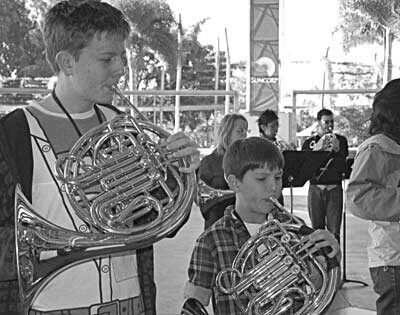 I live in Melbourne, and we’ve had a brass festival there for a number of years, in which the American Horn Quartet and Jeff Nelson have participated. But it has been special to have the horn symposium, with its larger contingent of horn players, in Australia. In addition to all the marvelous performances by established artists, hearing new talent is exciting – one wonders what direction these young players will be going. From the moment I clicked “go” on qantas.com.au, whenever Australia came up in conversation, I couldn’t suppress a sudden rush of joy and excitement. I had never been outside of the United States before, save for Canada, but that doesn’t count! This would be my second International Horn Symposium, and I could hardly wait! I arrived at LAX, alone and confused. But then I saw a person, like me, lugging a horn case. In the crowded terminal, I followed her for five minutes, James Bond-style, to the Qantas gate. One 12-hour flight later, we touched down on another continent. During the cab ride into Brisbane, I was overwhelmed by the energy and liveliness of the city. A couple hours after checking into the hotel, it was time for the IHS opening ceremonies. So I headed on over to the Griffith University Queensland Conservatorium, where a massive crowd of horn players had gathered. I immediately recognized one of my long-time horn playing friends, Lizzy, in a group of people; and as I headed in their direction, I passed by an elderly, yet curiously familiar gentleman in a burnt orange T-shirt. 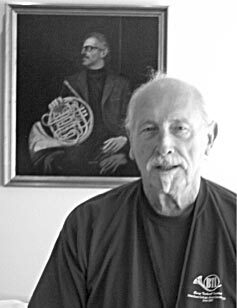 On the double take, I realized that it was none other than Australia’s own Horn Guru Barry Tuckwell! After my fanatic episode and inner debate on when to ask for his autograph, it was time for the ceremonies to begin. All of us hurried inside the beautiful auditorium to be welcomed by a romantic pattern of light across the stage curtains resembling “a giant brain,” as put so well by Kerry Turner. With a word of welcome from Peter Luff, a massive horn ensemble rushed the stage to perform an intense piece, commissioned just for the occasion. IHS President Jeff Snedeker then gave us some encouraging words and pertinent advice. He said to not try and do everything, but by trying to see as many of your favorite things, artists, and exhibits, you couldn’t help but have a spectacular time! And after all of my overwhelming thoughts from the hectic airline adventure and the sheer size of the city and the convention, Jeff reminded me that it was important to have as much fun as possible. The week progressed with concert after mind-blowing concert and presentation after inspiring presentation. My absolute favorite part of the week was that I was surrounded by the best people: horn players. Oh, and the exhibits were totally metal. I met some amazing people that week and I was so sad to leave Australia. On the plane ride back, I sat next to Dr. Rose French, and I couldn’t stop thinking over and over that I wouldn’t trade my experience at the 42nd International Horn Symposium for anything!